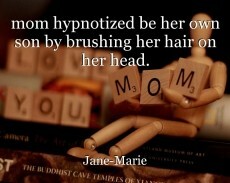 mom hypnotized be her own son by brushing her hair on her head. a mom is hypnotized by her own 18-year-old son, when he is brushing her hair on her head with a soft hairbrush. brushing, moving his hand on his mom's hair on her head. Mother succumbs to her Teenage Daughter's Seduction. The ??? ?NO MEANS NO! Campaign. a little boy is hypnotized by a witch. Mom hypnotized by a Vampire. deputy prison warden's wife abducted. This page was created in 0.3588 seconds.